Well known mobile DJ gear manufacturer Gemini has announced that the new CDJ-650 is now shipping. Following in the footsteps of the hotly anticipated CDJ-700 (reviewed in Pro Mobile Issue 53), the CDJ-650 employs many of the same features with a more modest tabletop footprint. Gemini's CDJ-650 packs flexible playback capabilities and professional features into a compact tabletop design, giving you the power to control your tracks with ease and creativity. Whether you prefer CDs, USB sticks or your computer, the CDJ-650 offers exceptional command with a 5" touch-sensitive jog wheel, programmable Hot Cues, variable Pitch Control and MIDI capabilities for use as a software controller. The CDJ-650 also offers a 3.2" full-colour TFT display with contrast adjustment and a comprehensive waveform display. 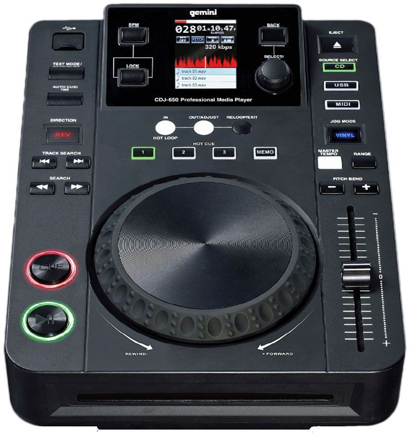 The CDJ-650 is available now priced at approximately £349.